I was recently sent two pairs of socks from soxxy.com, I've been meaning to get a post up about these for such a long time as I got them back in mid-december but my camera's been acting up. I took some 'arty' black and white photos because for some reason I think it goes with how I've styled the socks. Not sure why! 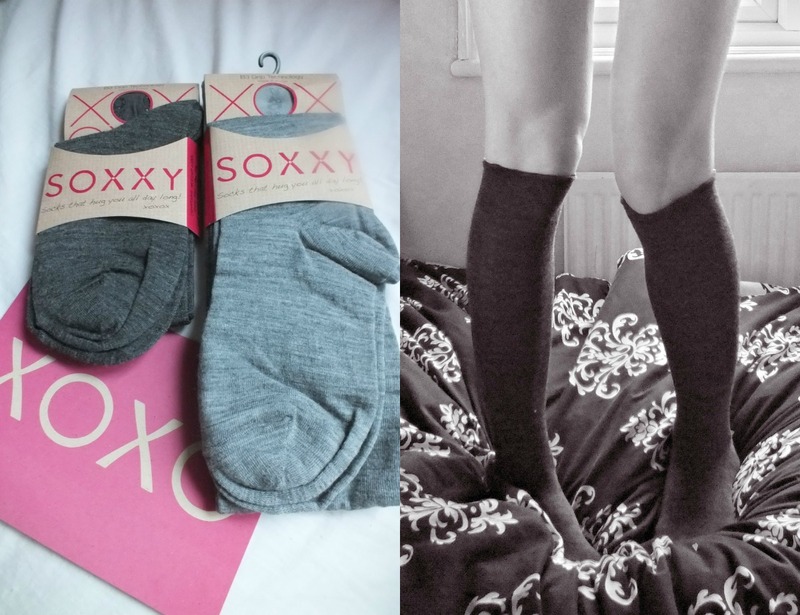 Anyway, Soxxy are such a cool company, their socks have a grip (seen in the first picture) around the top so they don't fall down! I love knee high socks and these dark grey ones are just lovely, they feel very high quality and true to claim, they do not slip or fall down at all. I've never really thought about getting good quality socks before and all my other knee highs were super cheap but I may be converted with these! I love the look of knee high socks but pulling them up all day is an absolute nightmare. What do you think of how I've styled these knee highs? The lighter grey pair are thigh high, which I've not really experimented with too much yet, so I'm working on styling those at the moment - watch this space! What do you think about the soxxy 'grip' idea? Would you like to give these a try? great review! these are super cool with the grips! you look gorgeous girl! These are really nice I love them. I don't know if you've heard of the liebster blogger award but I thought I'd let you know that I've nominated you for it, its meant for people with less than 300 followers but I broke the rules and nominated you anyway, as I love your blog :) xo. Love this look! I'm interested to see how you style the thigh high ones, I think I'd be a bit stumped with that one!! Such a great idea with the grip! Loving your arty pics too!! Love these and snap with the bedding!! i love this sox that is amazing sox for women..